The Soria Walnut TV Stand is an original design by furniture designer Alan Soria. 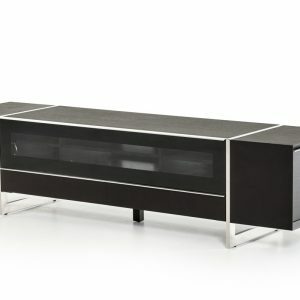 It features a rich walnut veneer finish which is accentuated by the push-open smoked glass doors and sharp geometric shapes of the cubbies. Two drawers pull outward for ample storage while the bottom middle door opens downward. 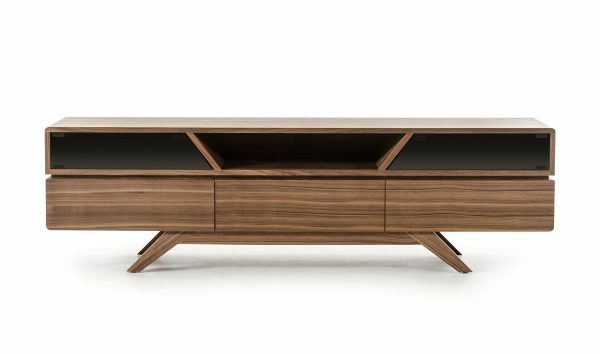 A deep groove encircles the Soria TV Stand and creates a visually pieced together design. User-friendly features include two electrical wire holes at the back of the TV stand that allow the cords to be organized neatly and rounded edges all along the body of the Soria.